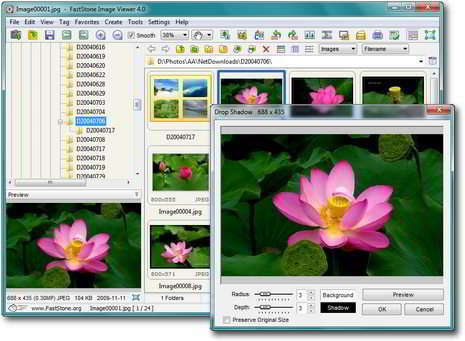 IrfanView has been my ‘go to’ quick image browser and editor for years. It is a great free program. But as I began spending more time on this blog, I ran into one small quirk with IrfanView that sent me looking for an option. My problem was that I wanted to find a quick way to upload the photos that I want to use in my posts here. I have come to the conclusion that it is necessary to use the built in Media Center in WordPress to handle photos for this blog. And WordPress does have a nice built in drag and drop interface that works very well. The trouble was that you cannot drag a photo from IrfanView. It doesn’t have drag and drop. They haven’t implemented in their program. It seems like a little thing, doesn’t it? But it’s not. So I went looking and happily found a program called FastStone Image Viewer and Thumbnail Browser. So far I have mainly used it only for viewing thumbnails. But if I never use it for anything else I’ll be happy. It is very fast with a number of excellent options. First of all, I love the drag and drop capability. It works flawlessly. And I also especially like how easy it was to add options to open images with external programs. It only took a few seconds to add IrfanView and two other image editing programs I use to the context menu. And then, sweet surprise, I see that the FastStone program automatically assigned hot-keys for these programs. Again, it seems like a little thing, but it shows that the programmer has the user in mind. All in all, with just a little use, I’m sold on this program. I highly recommend that you get a copy for yourself and give it a try. I think I can guarantee that you’ll be hearing more about it here as I spend more time with this very user friendly free program.